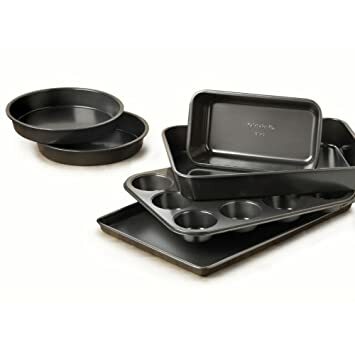 For Today 6/15 Only, Housewares Deals.com has Pedrini 6 Piece Nonstick Bakeware Set price cut for only $27 (Reg. $66), shipping is $4.95. This same product Pedrini 6 Piece Nonstick Bakeware Set price at $40.99 plus $8 shipping at Amazon.com. 6 piece set includes: two 9 inch springform pans, 8 inch square cake pan, 13×9 inch sheet cake pan, and two 11×17 inch cookie sheets. Dishwasher safe. This Pedrini 6 Piece Nonstick Bakeware Set gives you all the sweetest necessities for your baking needs. The heavy-gauge, aluminized steel springform pan and square cake pan are ideal for traditional favorites like cheesecake and brownies. The quality carbon steel sheet cake pan lets you bake your desserts and then transport them right in the pan. 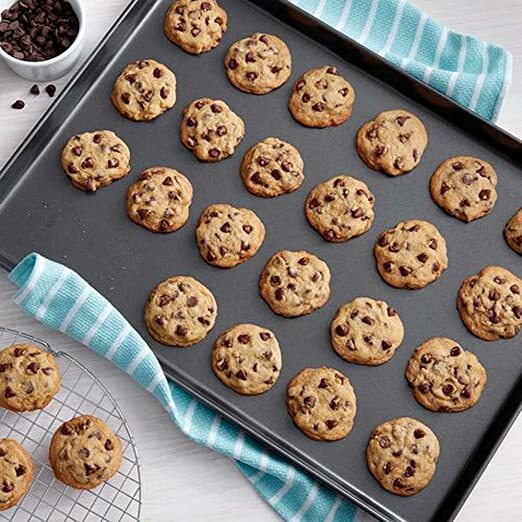 The heavy-gauge, aluminized steel construction cookie sheets help you turn out delicious batches of cookies. All items have a nonstick coating for easy food removal and quick cleanup. Walmart.com now is offering this Corelle Livingware 5-Piece Fun Pack in Winter Frost White for just $13.97 (regularly $29.99). Free in-store pick up. This set includes a large 2-quart serving bowl and four individual 28-ounce bowls. This Corelle Vitrelle Glass is break and chip resistant, stackable for cupboard space efficiency and dishwasher, microwave and oven safe! Now through July 4th, Macy’s.com is offering up to 20% off sitewide with promo code FOURTH at checkout. Shipping is free with a $49+ order OR free in-store pickup. Amazon now you can get this Wilton Perfect Results Premium Non-Stick Bakeware MEGA Cookie Pan for just $9.51 (regularly $15.99) – lowest price EVER! This dishwasher safe pan measures 15 in. X 21 in. and cookies and baked goods practically slide right off because of the non-stick surface! 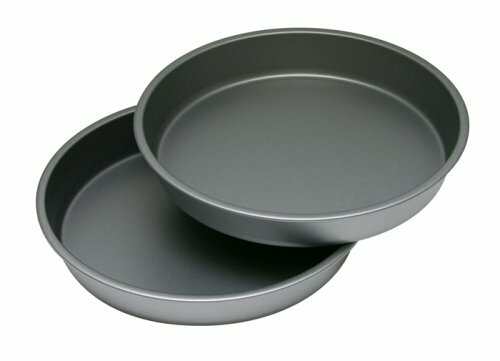 Amazon.com this OvenStuff Non-Stick Round 9″ Cake Pans 2-Piece Set for just $4.90 (regularly up to $9.99) – that’s just $2.45 per cake pan! These cake pans feature a non-stick finish both inside and outside of each pan that allows baked goods to slide out easily and makes clean up a breeze! Walmart.com now you can get The Pioneer Woman Flea Market 8-Piece Glass Bake and Store Set for just $17.88 (regularly $29.64). Choose free in-store pick up. This set is dishwasher, oven and freezer safe and includes a 3-quart Baking Dish w/Lid, 8-inch square Baking Dish w/Lid and two 1-cup Decorated Food Storage Dishes w/Lids. Today November 1st only, Amazon.com now you can save up to 64% off select Calphalon Kitchen Essentials including cookware sets, roasting pans, and cutlery. This would be a great time to grab new cookware for your upcoming holiday meal prep. Includes: Two 8-inch Round Cake Pans, One Medium Loaf Pan, One 9×13-inch Cake Pan, One 12-Cup Muffin Pan, One 10×15-inch Baking Sheet. Today, November 27th only, Macy’s.com now you can get this Pyrex 12 Piece Simply Store Set with Colored Lids for just $12.99 (regularly $40)! This set includes a 7-cup glass storage dish, a 4-cup dish, two 2-cup dishes and a 1-cup dish – and all come with plastic cover! Macy’s.com now get this highly rated 6-Piece Calphalon Nonstick Bakeware Set is on sale for $21.99 (regularly $29.99). Even better, you can save an additional 30% when you use the code FRIEND at checkout which drops the price down to only $15.39. 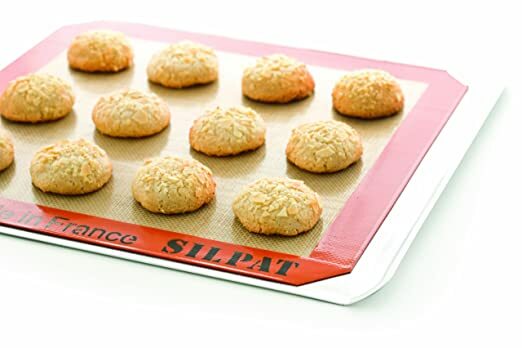 On Amazon.com you can now get this Silpat Premium Non-Stick Silicone Baking Mat – Half Sheet Size for just $13.31 (regularly $24.99)! 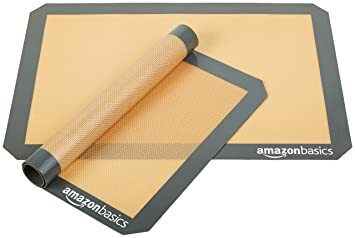 These baking mats help provide consistent heat for even baking and browning, and the non-stick surface makes cleanup easy. 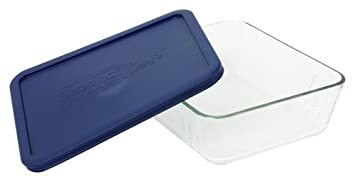 On Amazon.com you can now get this highly rated Pyrex Simply Store 11-Cup Rectangular Glass Bakeware Dish for just $5.16 (regularly as much as $12.58) – lowest price ever! Macy’s.com this Corningware French White 10-Piece Bakeware Set is marked down to just $29.99 (regularly $79.99). If you purchase this set before February 6th, there is a $10 mail-in rebate available making this set just $19.99! 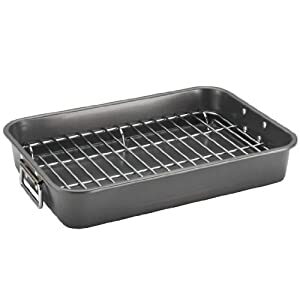 On Amazon.com you can now buy this Nonstick Bakeware 11-Inch x 15-Inch Roaster with Flat Rack in Gray for just $14.93! This roaster features a nonstick coating on both the inside and outside to make clean up a snap! It also features a removable chrome-plated flat rack, chrome-plated handles and heavy gauge construction that resists warping. On Walmart.com where they are offering this Copper Chef 2-Piece Copper Crisper for only $7.28 (regularly $19.92)! This Copper Crisper set features open sides that allow air to circulate to cook perfect french fries, chicken strips, roast vegetables, and more. Plus, you can use the basket on the grill too!